The cast is armed and ready to rumble. Missing: Santa Claus, but see below. Do not wait. 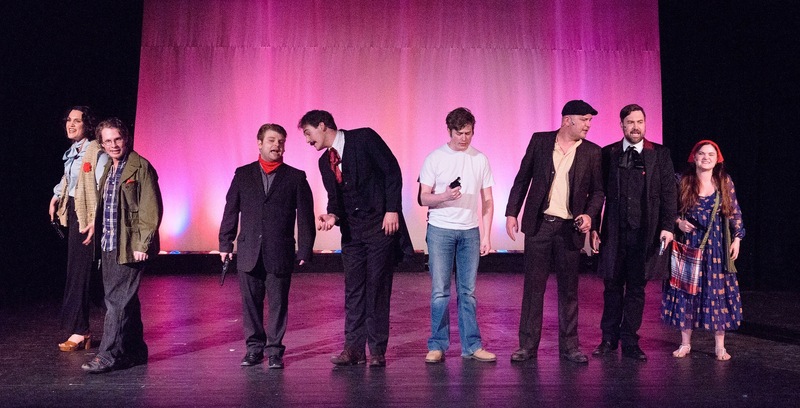 See the Stephen Sondheim musical Assassins. Stage 62, perhaps the region’s best community theater company, has mounted a strong production that ends its run on May 22. Why Assassins? Because it is an extreme musical. The scenes and songs range from extremely comical to extremely disturbing, and many moments are both at once. You may not want the music performed at a wedding or bar mitzvah, but one number— “The Gun Song,” an ironic ode to the joys of pulling the trigger—hits home so insidiously that you might think it should be performed in schools everywhere, as part of a lesson on gun violence, or banned as a song that’s dangerously suggestive. Some shows flirt with the fine line between farce and seriousness. This one tramples and obliterates the line, just as real life often does. Then again, Assassins is about real life (and death), telling the stories of nine men and women who killed or tried to kill American presidents. If some of the comic bits seem absurdly over-the-top, remember that the characters being portrayed were as weirdly deranged as the musical depicts. 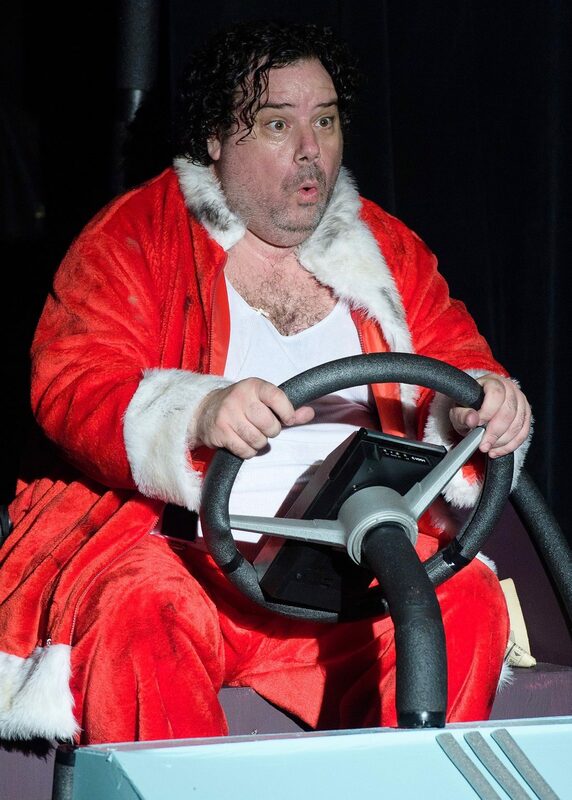 Assassin Byck (Rob James), dressed in the Santa suit he once wore to protest outside the White House, heads further off the rails. Before his failed attempt to kill Richard Nixon in 1974, Samuel Byck (played by Rob James) really did tape-record wacky, rambling tirades and send them to famous people, including the composer Leonard Bernstein. Assassins opens in a fictional setting, a shooting-gallery game at a fair, where the killers and wannabes gather. Fortunately this potentially hokey gimmick is not overused, and it quickly serves the purpose of bringing together assassins from different eras. Amid bonding and strange bedfellow-ship, they take turns acting out the deeds that earned them places in history. First to occupy center stage is Lincoln assassin John Wilkes Booth (Stanley Graham). This sketch isn’t the most powerful of the bunch; it’s melodramatic and predictable, but after that we’re off into the whirlwind of the great American madness. Librettist John Weidman wrote the book for Assassins, which provided crackling material to go with Sondheim’s music and lyrics. There are grim scenes like those tracing the tale of Leon Czolgosz (Darrel Whitney), the factory worker whose fuming discontent at social and economic injustice led him to assassinate William McKinley in 1901. Creepy hilarity reigns in scenes involving Lynette “Squeaky” Fromme and Sara Jane Moore (Kassie Doherty and Stephanie Ottey), eccentrics who came hair-raisingly close to shooting Gerald Ford. 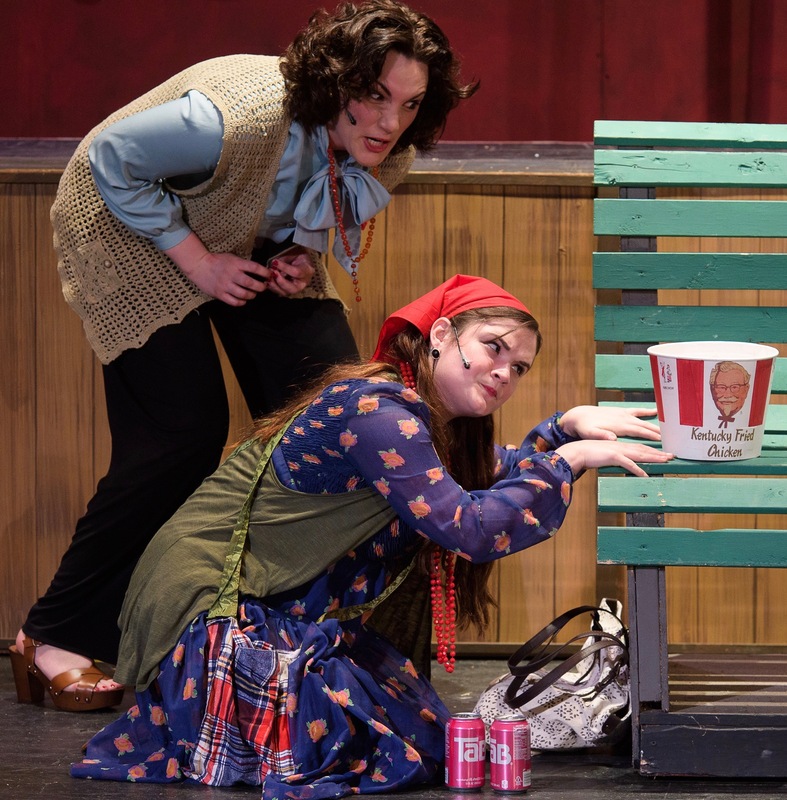 Moore (Stephanie Ottey, standing) and Fromme (Kassie Doherty) train their sights on a sinister symbol of patriarchy, Colonel Sanders. Byck’s tape-recorded rants are so obscenely entertaining that you don’t care whether they were taken verbatim from the real recordings or made up. Booth, after shooting Lincoln and himself, reappears as the ghostly muse and mentor of assassins yet to come. He’s much more striking in this role, suave and persuasive. When he counsels Lee Harvey Oswald (Connor Bahr) to kill Kennedy, maybe it’s melodrama piled on balderdash, but it’s wrenching. Assassins is one of Sondheim’s lesser-known musicals. The original version premiered off-Broadway in 1990 to mixed reviews and an early closing. Then in 2004 the current, revamped version won multiple Tony Awards, including Best Revival of a Musical, but remained under many people’s radar. When I first saw Assassins several years ago, I felt the intellectual rush of discovery. I enjoyed the show’s clever twists; I savored its insights into the nature of alienation and anger and violence—in short, it was an aesthetic trip. This time around, at Stage 62, my reaction was quite different. The aesthetic appreciation was still there, and I laughed again at the nutty parts. But much of the time I was overwhelmed with emotion. More than once I was teary-eyed and quivery. Maybe I have changed, and maybe the world has been changing, too. The political climate keeps getting angrier, the number of people who feel left behind or short-changed keeps growing—and so does the number of people I know who’ve been shot. Whatever the case, and despite the humor in Assassins, more than once I felt: This isn’t so funny any more. It’s too real. And with that caveat, my verdict stands. If you believe that the value of theater lies in how much it moves you, I would urge you to experience Assassins. Sondheim and Weidman’s Assassins is directed for Stage 62 by Nick Mitchell, with music direction by Michael Meketa. Nathan Hough plays the proprietor of the shooting-gallery game, and Mark McConnell plays Giuseppe Zangara, who tried to kill FDR. Everybody’s good. Through May 22 in the Music Hall of the Andrew Carnegie Free Library, 300 Beechwood Ave., Carnegie. For showtimes and tickets visit the Stage 62 website or call 412-429-6262. Photos are courtesy of Stage 62.